Barbara Sykes was born in Doncaster in 1944. 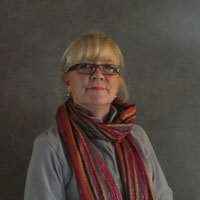 She worked for many years as a textile designer for two Manchester studios. She later combined raising three children with freelance design. In 1989 she returned to full time education and in 1993 she graduated from Bretton, Leeds University with a B.A Hons Degree in fine art. Also in that year, she was selected to be a studio holder with the Dean Clough artists in Halifax. She has held workshops, lectured and participated in open studios. She has exhibited extensively in both municipal and private galleries. 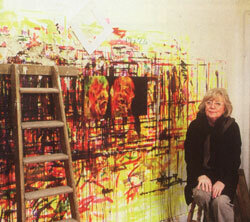 Her work is in public and private collections in the UK, France, America, Slovenia & Malaysia. Barbara's work is considered meditation on the 'human condition' from birth to death. By pouring and staining the paper the paint is allowed to ebb and flow organically, suggesting the visceral, never dogmatic but rather evocative of our own uncertain relationship with our own bodies. As apparently simple statements, her work sets up a duality, whereby on one hand, it clearly describes its subject whilst on the other, undermines the same subjects stability through nuanced and intelligent drawing. She uses water based paints and charcoal as her medium. Barbara graduated from Bradford University in 2005 with an M.A. in Printmaking.